When you communicate with others, everything that makes you unique comes into play. From your appearance to your voice, from your beliefs to your life experience, you're constantly sending signals about the kind of person you are. All of these signals, such as your facial expressions, your body movements, your vocal pitch, and more, are powerful and important in convincing others of your message. In You Are the Message, Roger Ailes argues that each and every one of us has the tools within us to persuade and influence others. And in this practical, sensible and entertaining book, you'll learn how to present a message so compelling that even your most stubborn detractor will see the merit of your ideas. 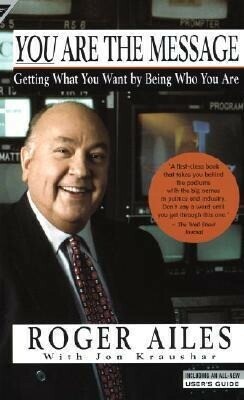 Roger Ailes founded Fox News in 1996, and was the CEO of Fox News for twenty years. An Emmy Award-winner, he was a partner in and executive producer of "Rush Limbaugh: The Television Show." Ailes' many other acclaimed productions include The All-Star Salute to Our Troops following the Gulf War, and Television and the Presidency. A political media adviser in three winning presidential campaigns, he also founded Ailes Communications of New York, consultants to corporations and entertainment companies. Jon Kraushar was the president and chief operating officer of Ailes Communications of New York. He is a former award-winning newspaper journalist and television news writer and producer.